The 1994 Monaco Grand Prix was the fourth round of the 1994 Formula One Season. Held at the Circuit de Monaco, Monte Carlo on May 15, 1994, it was the first race since the deaths of Roland Ratzenberger and Ayrton Senna at the San Marino Grand Prix. As a mark of respect, the front row of the grid was left empty, and the flags of Brazil and Austria were painted on the track at the position of the first two grid slots. The race was won from pole by Benetton-Ford Cosworth driver Michael Schumacher, his fourth consecutive win. It had been Schumacher's first pole position. Second place was taken by Martin Brundle, with Ferrari's Gerhard Berger in third. Formula One had been devastated with the death and destruction caused at the previous round of the world championship at San Marino. The three time world champion, Ayrton Senna along with rookie driver Roland Ratzenberger had both lost their lives over the course of the weekend whilst competing at the circuit. In respect of the fallen drivers', their teams Williams and Simtek had decided to field only one car for Monaco. Damon Hill and David Brabham would have to carry the hopes of their teams on their own. In response to this, Senna's old friend, teammate and rival, Gerhard Berger began to seriously contemplate retirement from the sport. Berger left Imola with absolutely "no desire" to get back into a racing car. There were fears among Ferrari that Berger had quit the sport when he refused to attend a test session for the up-coming Monaco Grand Prix. Berger had began to question his willingness to take the risk in Formula One to which he noted "I earned good money, I was driving for good teams. I was winning races, pole positions, quickest lap. Basically not a lot to prove, so what is the point still to take risk in what was every day work in this job." However despite the fears, Berger returned to the Formula One paddock ahead of the beginning of the Monaco Grand Prix weekend. Berger, realised that nothing else could replace his "love" for Formula One. Berger further commented, "Basically you don't love anything else. I have a company at home, I would have a challenge in my company but what I love is driving racing cars." The FIA under the leadership of Max Mosley began working immediately to overhaul the regulations in regards to safety. In the immediate aftermath of Ratzenberger's fatal accident, both Senna and Schumacher proposed that the pit-lane speed limit be implemented for the next round of Monaco. Following Imola, a pit lane speed limit had been approved for all future races. During the morning practice, Wendlinger loses control of his Sauber exiting the tunnel and flew into the barriers at the Nouvelle Chicane. Wendlinger was extracted from his car with serious head injuries. Sauber decide to retire their one remaining car of Frentzen from the race. However there was some positive news when the FIA confirmed that his condition was "serious but stable." The telemetry data demonstrated that Wendlinger had braked 13 metres too for the Nouvelle Chicane and had crashed. The non-track day of the Monaco weekend saw the drivers' and team personnel attend the traditional social events. However before the attempted relaxation could commence, the drivers' gathered for an emergency meeting to discuss the increasingly dangerous new cars. Aside from the death's of Senna and Ratzenberger there had been very serious accidents for Lehto, Alesi, Barrichello and most recently the grave injuries of Karl Wendlinger. There to rally the shaken race drivers in the meeting was Niki Lauda, the three time world champion whom had most infamously survived scarring and death during his old career. In San Marino, Senna, Berger and Schumacher had planned to reform the Grand Prix Drivers' Association (GPDA) for the Monaco race. Although Senna had now departed, the GPDA was as planned recreated before the Monaco race. At the conclusion of the meeting, Lauda led the assorted drivers' to meet the most numerous and eager press. Lauda confirmed the reformation of the GPDA to the world and announced that both Berger and Schumacher, Christian Fittipaldi and himself would serve as the directors' for the organisation. Lauda noted the GPDA's first plan of action was to work alongside the FIA to ensure there was "immediate action for the next three Grand Prix's circuits" in terms of improving the safety standards of the races. FIA President, Max Mosley immediately responded to the demands made by the GPDA. That afternoon he hosted a press conference to which he announced that the next race in Barcelona would see all cars have a mandatory smaller diffusor, raised front wing end plates and smaller overall front wing size. Mosley then noted "the effect of that for those that are not technical is that the downforce on the car will immediately be reduced." The cars were expected to have 15% reduced downforce ahead of this race. In two races time in Montreal, Mosley planned to increase driver head protection by increasing the overall size of the cockpits. The weight limit for the car would be increased to 25 kilograms to adjust for the heavier requirements. Furthermore, Mosley announced that the wishbones would be strengthened to help prevent a wheel detachment, the airboxes on the engines would all be removed as well as mandatory pump petrol being used on all cars. Schumacher had set the fastest time during the Thursday session, however on Saturday the McLaren of Häkkinen would set the new benchmark. Häkkinen's lap time proved to be blindingly fast, he was eight tenths quicker than Schumacher and had improved his personal best by two seconds. Despite fears for his retirement, Berger was performing well and was running third fastest behind Häkkinen and Schumacher. Although Häkkinen appeared to hold control over the session, towards the end of the session, Schumacher set a new lap time to which meant he went a whole second faster than the McLaren. Schumacher's qualifying time was described as "staggering" and "near perfect" to which none of his rivals could find a possible answer to his time. In describing his lap, Schumacher commented "I just knew this was the lap that the tyres would perform 100% and was going to make a big step compared to the first lap. In the last corner I came really sideways and I lost quite a lot." Ahead of the race, a minute of silence was held on the grid in memory of Roland Ratzenberger and Ayrton Senna after their deaths at the San Marino Grand Prix. The first row of the grid was left empty ahead of thee race, the grid positions painted in with Brazilian and Austrian flags. Senna's Brazilian racing compatriots, Rubens Barrichello and Christian Fittipaldi held a Senna liveried Brazilian flag which read "Adeus Ayrton." Schumacher took a commanding lead of the race as behind him, Hill collided with the rear of Häkkinen which forced the McLaren to spin into the escape road at Sainte Devote. Behind them there was further chaos when Morbidelli and Martini crashed before even reaching the first corner. Häkkinen had meanwhile stalled his car and was out of the race whilst Hill had damaged his suspension and was forced to also park his car. Schumacher began to pull away as behind him came the Ferrari's of Berger and Alesi whilst a short distance behind them were Fittipaldi, Brundle and Blundell. 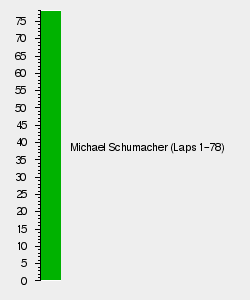 By lap twenty, Schumacher began to exert his authority on the field having lapped the entire field up to eighth position. After fourty laps, Berger was a long way distanced from Schumacher's lead, however he himself had a sizeable lead to Brundle's third position. However when Blundell suffered a blown engine at Ste Devote, Berger spun on the oil of the stricken car. Three corners later, Brundle whom had quickly caught Berger then overtook the Ferrari around the outside at Mirabeau. Although Brundle had made it to second, he had no chance of catching Schumacher's Benetton whom would take another victory without anyone to challenge him at the flag. With Brundle and Berger completing the podium, the final points positions went to De Cesaris, Alesi and Alboreto. A frustrated Berger had finished third after having lost the position to Brundle when he spun on the oil of Blundell's blown engine. Berger admitted after the race, "I saw too late the oil flag and I lost about nine or ten seconds and so Martin was just behind me." During the race at Monaco, Lamy had become the first driver to exceed the pit lane speed limit and was subsequently given a $5 000 fine. Michael Schumacher's first pole position, 4th consecutive win, and first Double, Hat-Trick and Grand Chelem. This was the first race since the 1959 United States Grand Prix to have no World Champions in the field.